Relicensure points for educators are available from the Utah State Board of Education for all workshops. For more information: Email or 801-585-9191. Paul Moxon is a studio letterpress printer and independent educator (MFA, MLIS Alabama). He has lectured at over sixty book arts centers and universities through the U.S. and Canada. He is the author of Vandercook Presses: Maintenance, History and Resources and moderates vandercookpress.info. Paul is the website editor for the American Printing History Association and has held fellowships at Rare Book School and the Newberry Library. His letterpress work can be found in several public collections and at fameorshame.com. Register through Continuing Education here. Allison Leialoha Milham is a book artist, musician and proprietor of Morning Hour Press. She received her BA in Studio Art from San Francisco State University, CA (2006); and her MFA in Book Arts from the University of Alabama, Tuscaloosa (2012). Her work is held in multiple public collections including Yale University Arts Library and The Library of Congress and is represented by Vamp & Tramp Booksellers and Brooklyn in NYC. Spend the day with local artist Claire Taylor and learn linocut reduction carving and printing techniques. Claire covers how to tightly register multiple print runs from the same linoleum block on a flatbed letterpress. Participants print two or three runs from the same block, resulting in a layered print with slight color shifts. Each participant leaves with an exchange portfolio of prints and the knowledge to carve and print in the future! Claire Taylor holds a Master of Science in Environmental Humanities and a Bachelor of Fine Art with a Printmaking Emphasis from the University of Utah. She formerly worked as the Studio Manager, Instructor and Lead Printer at the Book Arts Program & Red Butte Press. Claire recently completed a yearlong artist residency with the Utah Museum of Contemporary Art. She has exhibited extensively in Utah and has shown nationally and internationally, and her work is held in public collections across the United States. To see Claire's work, please visit www.clairetaylor.art. Skip the typesetting, bypass the carving, and get digital using current design software and laser-engraved woodblocks to print illustrations and halftone images. This workshop melds old and new technologies, with a focus on basic skills in digital design and letterpress printing. Spend the first day in the Marriott Library computer lab learning to design, edit, and prepare your digital files for output to the laser cutter. The following Saturday, learn how to print your laser-engraved woodblock using our Vandercook proof presses. Leave with a portfolio of work from your classmates and your own edition of 10 prints. Get a handle on what it takes to crank out an edition of gorgeous letterpress prints. 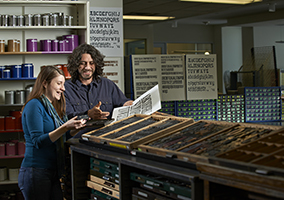 This active, eight-week class introduces the fundamentals of letterpress, from paper selection and cutting to mixing ink and printing. Guided by the instructor, participants design and produce four individual projects using a variety of relief techniques and tools including metal and wood type, zinc cuts, linoleum blocks, pressure prints, photopolymer plates, and collagraphs. Students should expect to spend time out of class each week to complete projects. Free upon registration. Space is limited. Are you looking for a unique and engaging way to increase student participation? Books arts is your answer! Help your students develop critical and creative thinking skills through bookmaking. Come learn how to make simple book structures that you can use in any classroom with any content. This two day workshop will feature hands on learning, lesson plans, and handouts that you can take back to your classroom and apply to any lesson. We will use accessible, inexpensive materials and tools to create functional books that take the worksheet and handout to the next dimension. We'll brainstorm ideas and discuss various ways to incorporate bookmaking into teaching for any content area.